These hanging hearts are so simple and quick to make and very effective. In fact, they're an ideal project for beginners who might need a little practice with a sewing machine - and a few wobbles actually add to the charm of the finished piece. 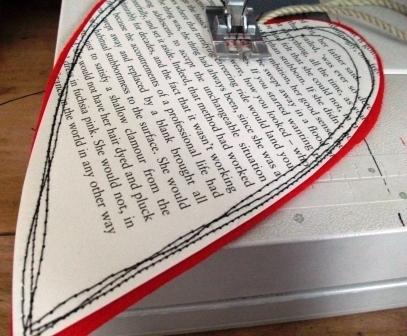 You can use straight stitch on your sewing machine or you could practise your free machine embroidery techniques with these. Either way, you'll end up with something pretty to brighten up your space. 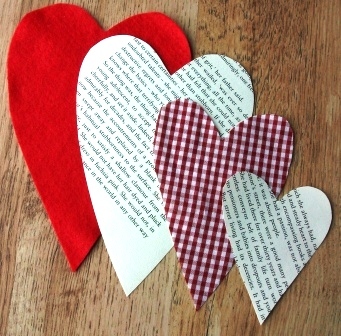 Cut four heart shapes from fabric and paper, making each one a little smaller than the first. 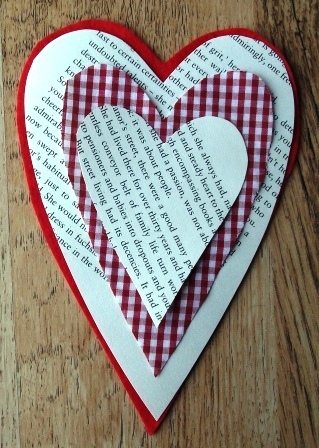 I used an old damaged book so I didn't feel too bad about cutting it up! If your freehand cutting skills aren't great, make a paper template first (fold the paper in half and cut while folded to get a symmetrical shape). Set your machine to a slightly longer than usual stitch length or use free machine techniques. Using black thread, sew them together. Don't keep your stitches too neat and you'll get a lovely sketchy look. 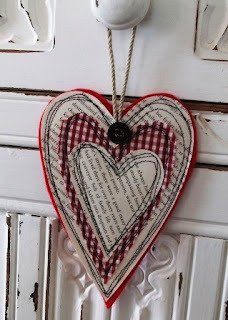 Nice project and so simple and quick, but look so fab. They're a lovely variation. Well done! These look great! 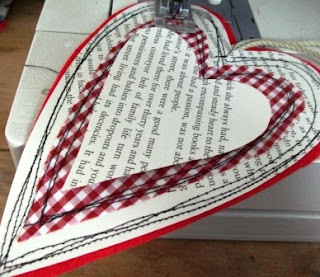 I am a beginner and still getting to grips with my sewing machine, so this is a great project to try. Thanks for sharing. Great tutorial, lovely project. They look so pretty hanging up. 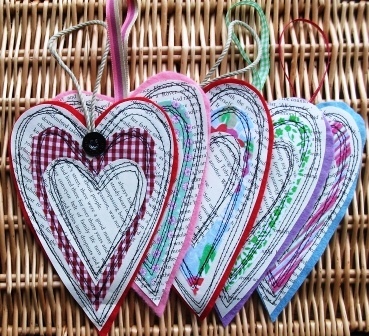 I wonder if you could do heart bunting? That is so adorable! I can't wait to try it! So cute and lovely!! thanks for sharing! go difficult craft.I am six and half month pregnant and not going to my job and no money to buy a gift.But i can and like to give them a hand made craft. 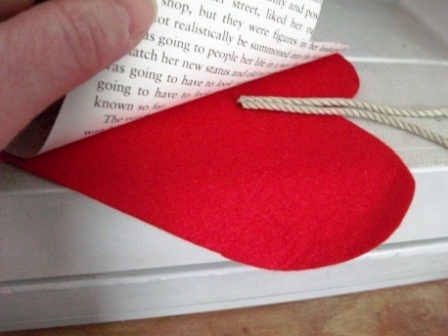 i choose your hanging heart. it is lovely and very suitable for my idea. Now I am making a Hanging Heart as a wedding anniversary gift for my parents. I have to try this tutorial, thanks a lot for sharing.